Touching the imagination, inspiring, and connecting you to the rich stories and history of our Nation’s Capital, WashingTours & Events brings Washington D.C. to life for you, your clients, and guests. Based in Washington D.C. WashingTours & Events offers multilingual cultural and themed tours; culture, communication, and event management workshops; and a professional tour guide training program. WashingTours & Events is a member of the Guild of Professional Tourist Guides of Washington D.C. International Events Society, Cultural Tourism DC and Destination DC. We invite you to contact us and look forward to serving you. 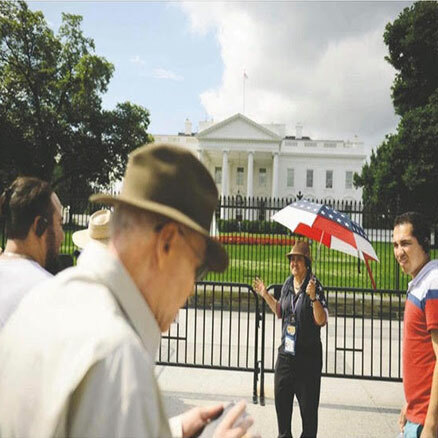 Maricar’s WashingTours & Events offers an intensive, 50-hour tour guide training program to up-level the skills of any tour guide and provides supplemental two-hour study sessions and study guide focused specifically on Washington, DC area attractions. "It started, as it often does, when the DC Nation Tours bus passed Trump International Hotel on Pennsylvania Avenue near the White House. A many-accented murmur of curiosity was followed by a shouted question from a Peruvian visitor in the back."